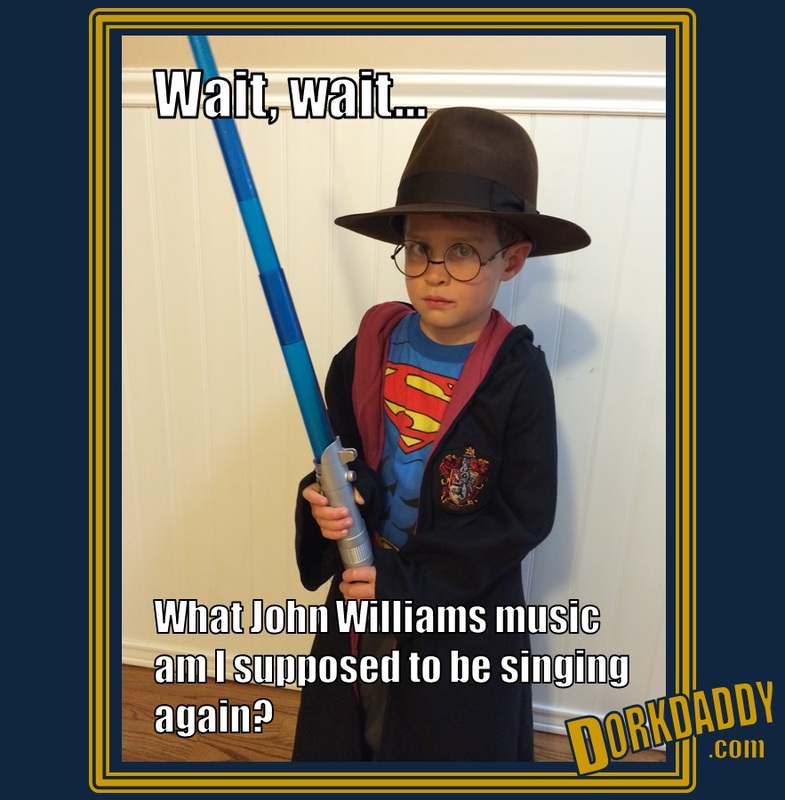 his year for Halloween my son will be going as “John Williams Music”. …not really. But this picture was so awesome I just had to share. Permit me to table the 40th birthday discussion for just a moment. I promise I’ll swing back around to it. Instead I’d like to share with you something I tripped over on the interwebs about 9 months ago. 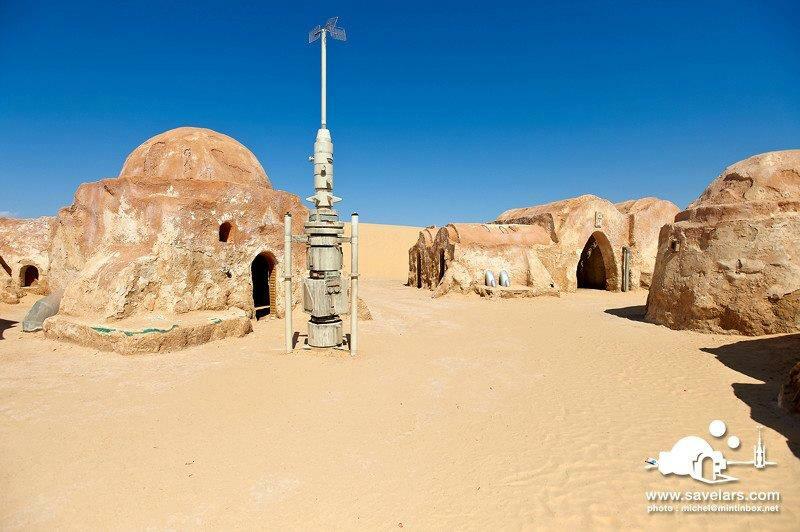 Some of the Tatooine filming was done using pre-existing buildings, taking advantage of the unique architecture of the region. 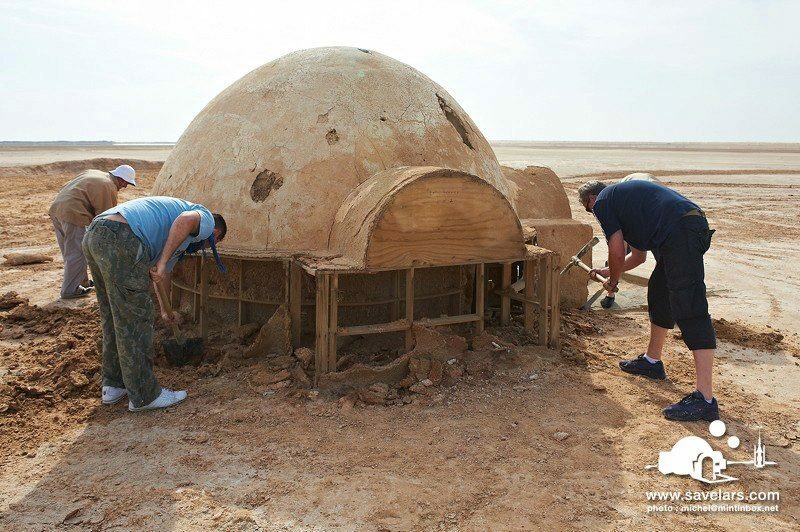 Some setpieces, like the igloo in the picture above from the homestead of Luke’s adopted Uncle and Aunt, Owen and Beru Lars, were constructed specifically for the movie. When filming was done the crew packed up and headed back home, leaving those setpieces just standing out there, weathering in the middle of the desert. 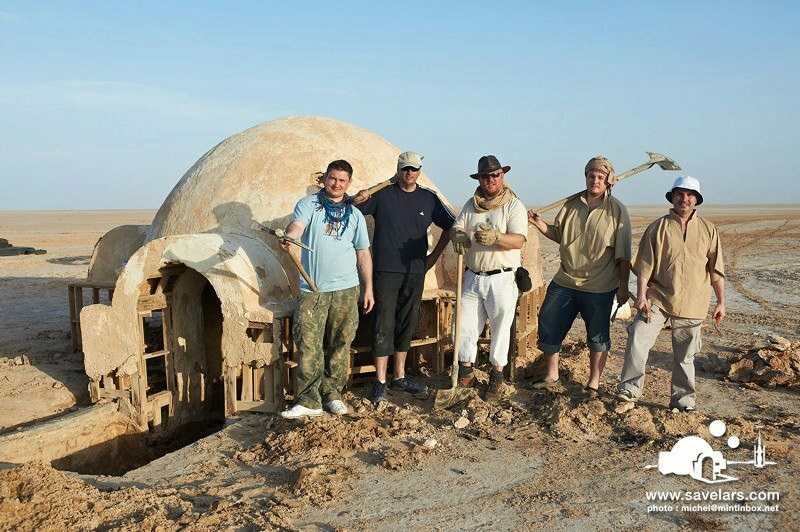 Over the years the most tenacious, intrepid Star Wars junkies have made the pilgrimage to the Tunisian desert to actually stand in the sands of Tatooine, next to the very structures on the very planet they visited in their imaginations countless times before. The nearby town has enjoyed the tourism dollars over the years, and is very friendly to traveling Westerners on their way to take a picture on the Lars homestead. 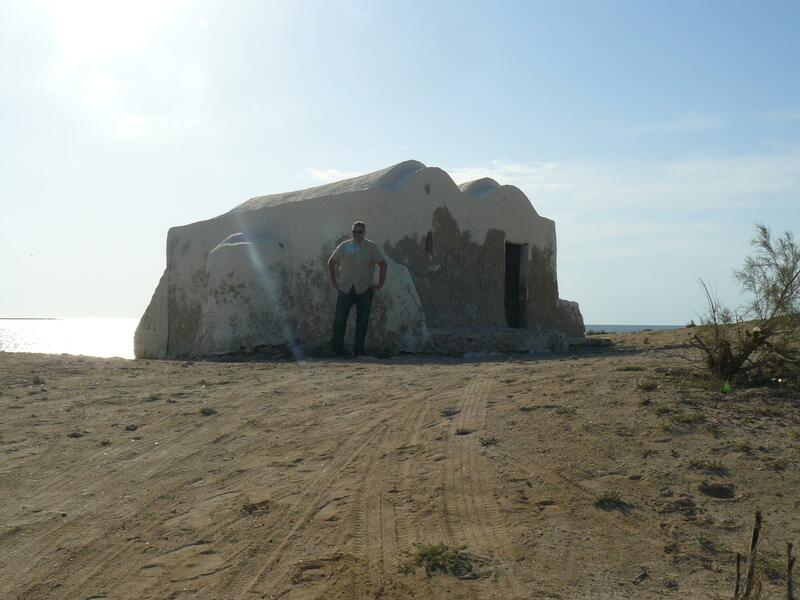 Obi Wan Kenobi’s hut is actually a little fishing shack, still in use by the locals. Mark Dermul is one of those travelers. Since the early 2000’s he’s periodically headed to Tunisia from his home in Antwerp, Belgium to visit the set locations. In his travels he met Terry Cooper, Robert Cunningham, Mark Cox, Imanuel Djik and Michel Verpoorten, Star Wars geeks the lot of them, from all different corners of the globe. At one point a few of them found themselves standing in the desert in front of the Lars homestead igloo, saddened by its profound deterioration in the harsh desert environment. Someone got the harebrained idea to restore the structure, and that was the spark that ignited the fire. 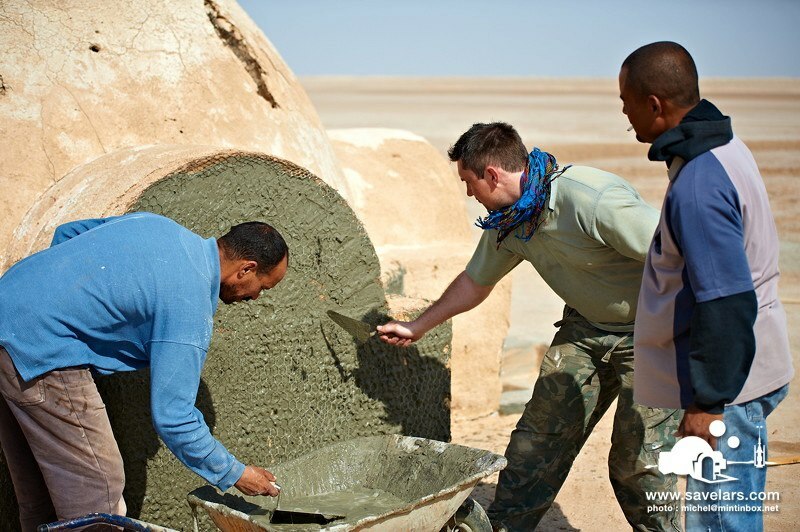 One successful $11,000 kickstarter campaign, a Facebook page, and a whole lot of logistical planning later and the group of 6 Star Wars geeks from around the globe wound up doing masonry work in the hot Tunisian desert sun (120+ degrees!!) in the Summer of 2012, working to restore and preserve one of the most iconic movie sets in film history. I have to admit, when I heard about the project (after its completion) my feelings were a little hurt. How could someone do something like this without me? How had I not heard about this before? I would have been a powerful ally, or in the word of The Emperor a “great asset”. I would have been a firm, dedicated partner in a project like this. I would have flown myself out to Tunisia. I would have raised funds. 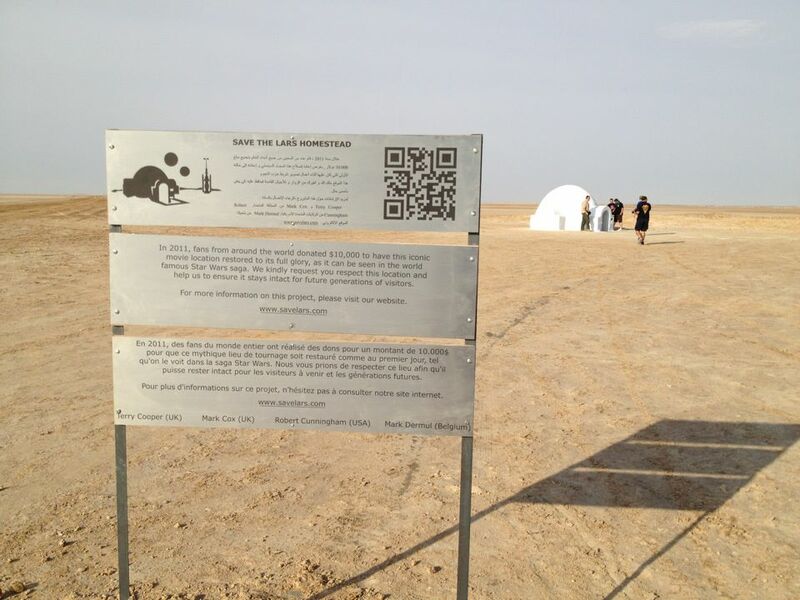 I would have stood out there under that (one) Tatooine sun and stapled chicken wire until my fingers bled. I would have swung pickaxes. I would have shoveled sand. I would have been totally committed. If only I had known. Of course there was no application to be submitted, no audition or screening process to prepare for. This was just a group of friends who got a wild idea and totally pulled it off on their own (without me). Their entire adventure was of course documented, and can be found on the project’s website SaveLars.com. If, like me, you could spend hours just staring at the amazing photographs they took, they chronicled the entire experience in a hardback book (with a forward from Luke Skywalker himself, Mark Hamill) available here (I’m totally buying it). Just as impressive as the feat itself is the fact that despite the overwhelming media attention they received (and are still receiving), the six “Saviors” (that’s what they call themselves) are all very friendly and approachable. 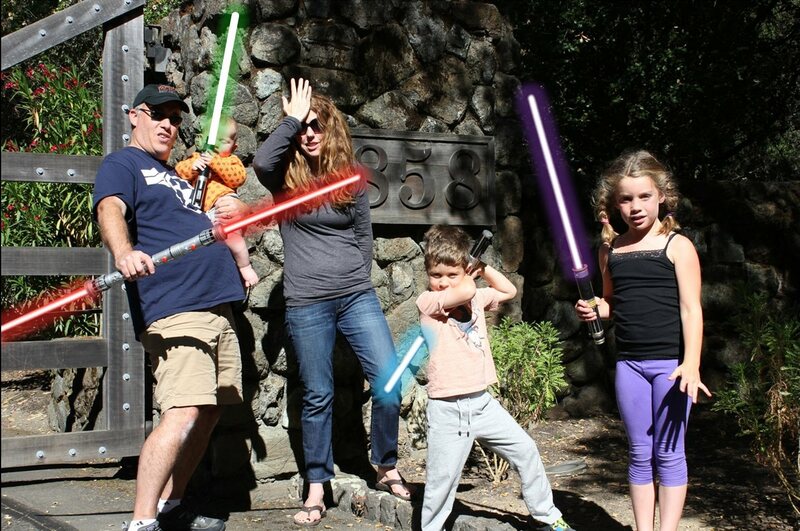 They’re just Star Wars geeks, like so many of us out in the world. They’re proud of the work they did and they’re excited to share it with everyone who wants to hear about it. This month marked the 1 year anniversary of their trip, and in honor of that I asked them if they wouldn’t mind being interviewed for DorkDaddy.com. They generously agreed. DorkDad: How did you become involved in the project? Mark Dermul: Terry and Rob came up with this plan, albeit as a joke at first, they soon found themselves ‘confronted’ with so many positive reactions from the fans that they realized it would indeed become a reality. That’s when they contacted me, being well versed with the Tunisian lifestyle and having many contacts there. It took me about two nanoseconds to decide I wanted to be involved. 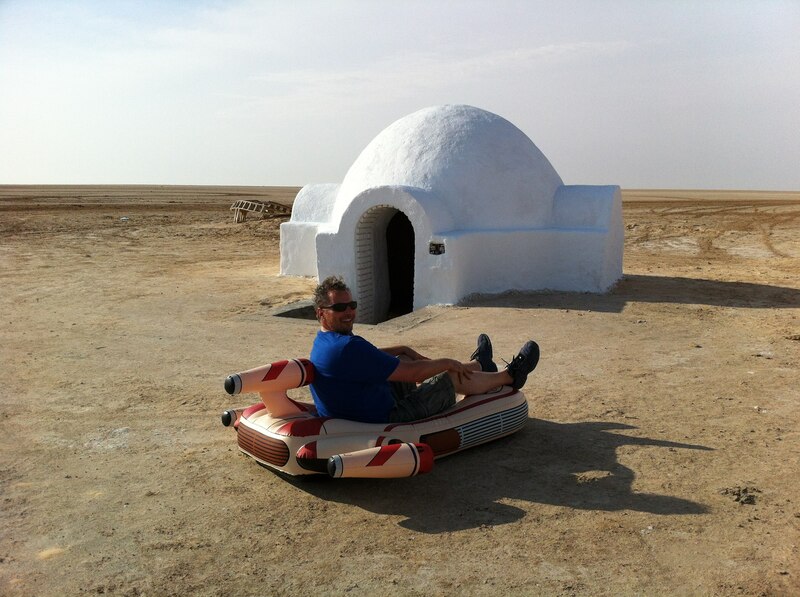 Terry Cooper: I joined Mark Dermul on his ‘Trip to Tatooine’ back in 2003, to satisfy my longing to visit Tunisia for the first time. I’ve been there a couple of times since and in 2010, we were all shocked by the gradual deterioration of the Homestead. That impressed upon us the urgency of a campaign to restore it before it became unsalvageable. Michel Verpoorten: I’ve known Mark Dermul in events and conventions. When I heard about the project I say him that if they were looking for a photographer to cover the story I was available. While I was just only the photographer of the project, I was completely integrated by the team as their own, I was even more proud to be really a savior of the Lars homestead. Mark “Coxie” Cox: Well It came about in Tunisia when myself and terry began talking about coming back and restoring the homestead. We could clearly see that she was starting to fall apart and wouldn’t last much longer. So after a couple of weeks after arriving back in the UK we brought in Terry to join us… as it was the conversation with Terry that gave us the idea. Rob Cunningham: In 2009, I met Mark Dermul in Como, Italy, and he offered the chance to join him in Tunisia the next year. While I was in Tunisia with the group, I met with Mark Cox and Terry Cooper, while we stood at the Igloo. And the rest is, as they say, history. Imanuel Djik: During my visit with Mark Dermul, Mar Cox, Robert Cunningham and Terry Cooper in 2010 we saw the Homestead deteriorate fast. I contacted Mark D about my wish and motivations to get involved. Since they knew extra hands would be needed they welcomed me on board. DD: On the surface you have to admit, the project has to sound like a pretty hairbrained scheme. 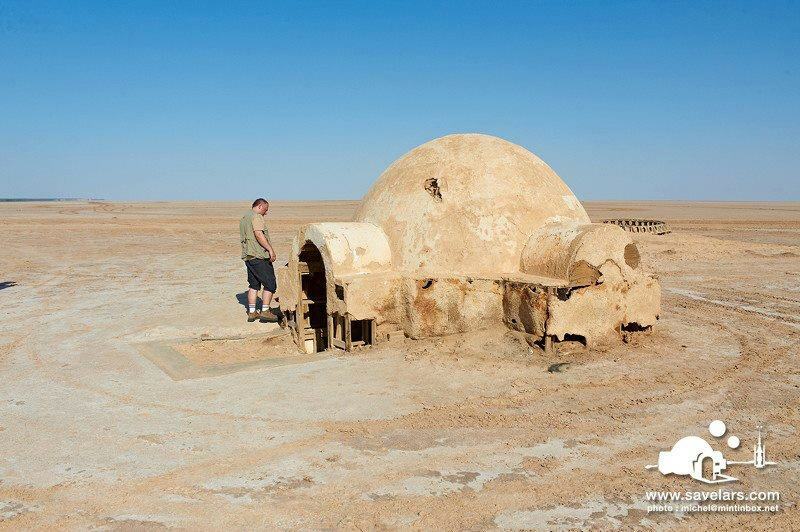 How did the people in your life react when you told them “I’m going to Tunisia to rebuild the Star Wars sets”? ID: Some declared me insane, other called me geek or nerd. Family and friend said it was the coolest thing ever and are proud. RC: Well, many of those close to me where already aware of my deep intrinsic love for the Star Wars Saga. For those who did not know of my love for SW, I would talk to them about the economic assistance that this project would provide for the local economy. MD: Ha, well, since people in my direct surroundings are aware of my “Trip to Tatooine” outings, they only shook their heads a couple of times, before realizing if anybody could pull this off, it had to be us. Let’s not forget, we did not plan to rebuild the Star Wars sets (plural), but only to restore the Lars Homestead. One small building, albeit in the middle of nowhere (quite litteraly). DD: North Africa — 2012. The first thing people think is “Arab Spring” and the self-immolation in Sidi Bouzid in late 2010. Were there any concerns along those lines? MD: There were many concerns along those lines as you can read in our online diary. 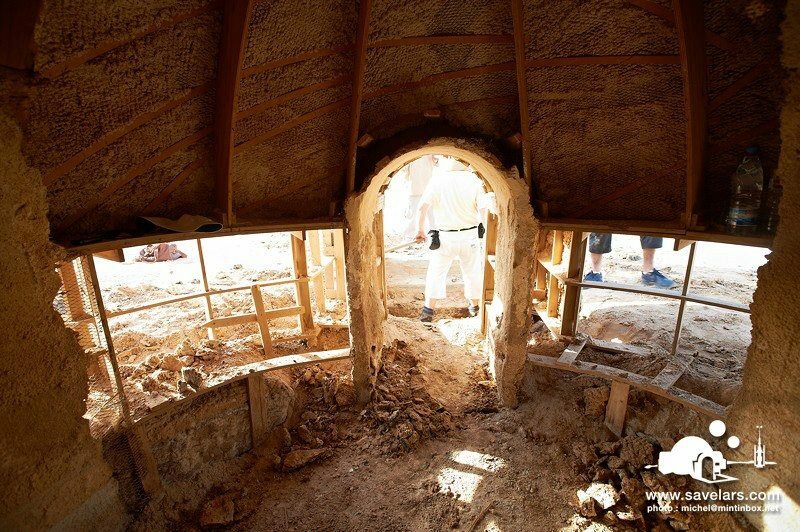 We had to negotiate with the ONTT (National Office of Tourism in Tozeur), who were in direct contact with governor and Minister of Antiquities, who had to approve the project and provide us with the necessary permits. While the initial negotiations went smoothly, it took the better part of a year after the Arab Spring erupted, before we were contacted again. We had to wait for the new government to be installed before our project could go forward. Once that was the case, it went rather quickly. TC: We were worried that the incoming new government would deny us entry to the country or refuse our request to work on the Homestead. Fortunately, we were allowed to proceed, thanks mostly to Mark Dermul, who spent months in negotiations with the government and tourist board of Tunisia. MV: To be honest all along the road and locations where we was I never had a feeling of unease from Tunisian people at these moments. DD: What were some of the behind-the-scenes logistical headaches (permits, travel, etc.) behind the project? MD: Permits was a big hurdle in terms of time. Travel is easy, no worries there. Everybody came to Brussels (Belgium, my home) and I arranged for the collective flights into Tunisia from here. Renting a van for six and our materiél was no biggie either. For the tools and building materials, we had agreed to work with a local contractor, to support the local economy. The biggest headaches were the working conditions (the heat was unbearable). We could only work from 6am till noon and from 5pm until sundown (around 7pm). So we had to get up at 5am every morning. We dubbed it silly o’clock. RC: The hardest part for me was being on the other side of the world from the others. When we needed to plan something, one of them would throw it out on email, and by the time I woke up here in Arizona, the rest of them had figured it out. Sometimes, I wish I could have contributed more. Don’t get me wrong, it’s not anyone’s fault, it’s just living over here made it hard. 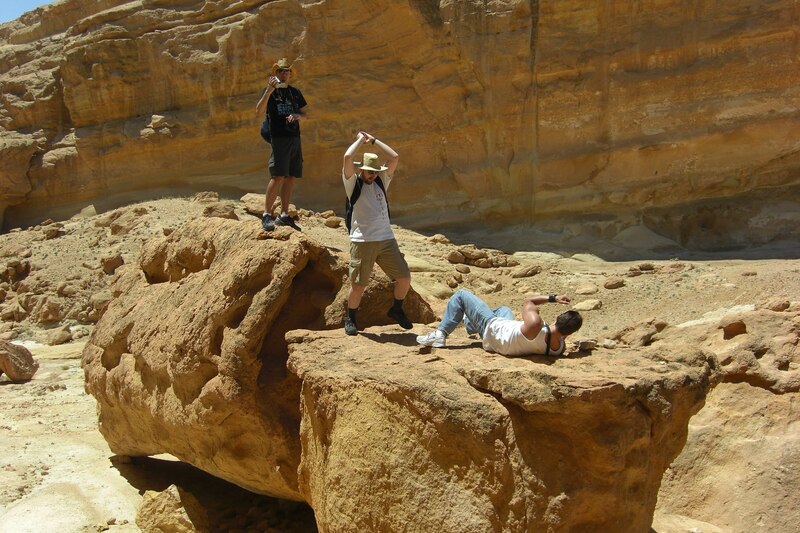 The rock where Luke was attacked by a Tusken Raider. 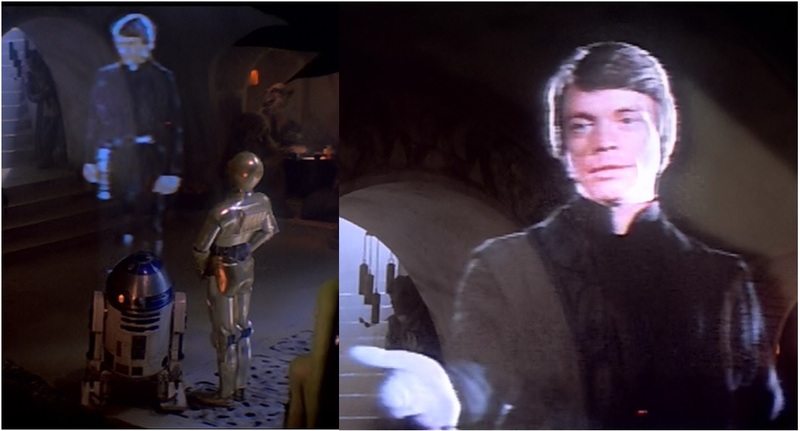 DD: Not only did you restore the Lars Homestead, but you were able to find some of the other significant Star Wars locations in the area. Aside from the reconstruction, what are your favorite Star Wars related memories of the trip(s)? ID: For me, next to the Homestead it would be the Mos Espa set and the so-called Star Wars Canyon. TC: Mos Espa is nearby, and although it’s beginning to deteriorate and the huge dunes are moving in on it, it still looks very impressive. I’d advise any big Star Wars Fan to visit it while it still exists. 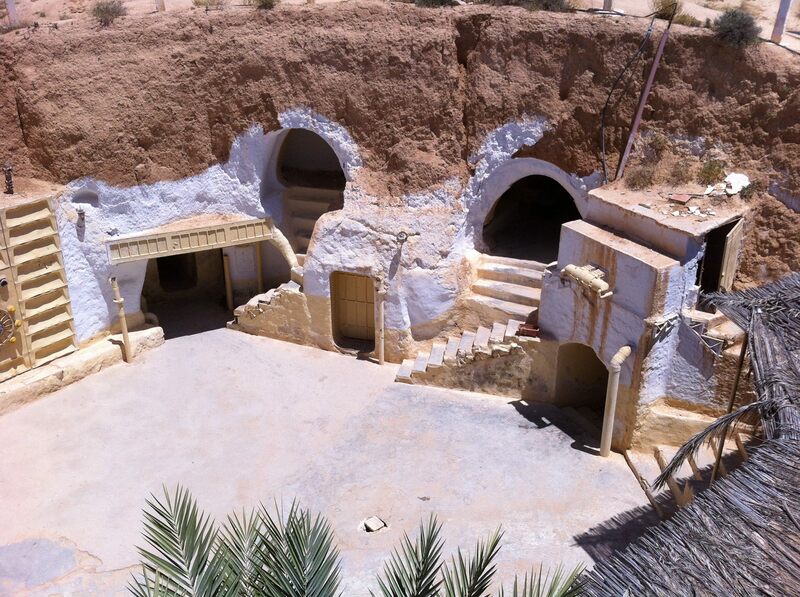 But for me, the Hotel Sidi Driss willl always be my favourite location as it just feels so real, and takes you back to A New Hope whenever you stay there. RC: My personal favorite memory was when we walked into the Hotel Sidi Driss and one of the employees yelled “ROBERT! MY FRIEND! HOW ARE YOU!” I was shocked. I had met this man two years earlier, and only been there overnight, yet he remembered me. By name. This made my day. DD: Please describe your feelings, out there in the desert, when the Lars Homestead first came into view. MD: When I first visited the Lars Homestead, many years ago while it was still in good condition, it gave me goosebumps. I remember standing out there during a sunset with John Williams’ soundtrack on the iPod and I actually shed some tears. I was not alone, by the way. It was a very emotional moment. TC: I first saw it in 2003 and as we spotted a shining white dome in the distance, I felt intense excitement. It takes a while to get your head around it. But you notice that observers all seem to stand at the same spots, to witness it as it is shown in the film. MV: You have the heart at 160bpm, thrilled and excited was the first words. No other words was coming! ID: Pure excitement and joy. It is such an amazing place. Magical. It brings back all those childhood memories in a heartbeat. When you get there you hear the John Williams score, you see Luke Skywalker standing on the crater edge…goosebumps. 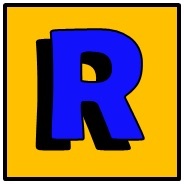 RC: The first time- I cried. The second time- I choked up. It is pretty much the only thing you can see in a 360 degree view. Just the vehicles, and the igloo. It is sobering. To stand there, where movie history was made, and to ‘be’ inside the movies and books, was amazing. You hear people say “close your eyes and imagine…” Well here, we didn’t have to close our eyes. We could imagine with our eyes open. DD: After such an amazing, epic project, I imagine you all have grown pretty close. And yet, the job is done. What does the future hold for The Saviors? TC: We’re certainly immensely proud of the campaign, and eternally thankful to the thousands of fans who helped us by raising funds and awareness so that we could do it. I think the next location that will be totally demolished soon is the Cantina exterior at Ajim. I really hope any future fan campaign is aimed at keeping it maintained, preserved and restored. But I think this will be for the next generation of Saviors. I’m happy to advise and support anyone attempting to do what we did, but I see my part in it over now. And of course, the Lars Homestead will still need maintenance in future. It’s not indestructible. ID: Sometimes we joke about restoring other sets. And we would love to do so. On the other hand, we are hoping that we inspire other fans to restore the other sets. MV: Indeed, I was coming almost alone and I left Tunisia with a tribe. We will keep this adventure always in our memories. DD: In the off chance that you all should head out there again, what do I need to do to get a spot on the expedition? MD: If we ever plan to go back out as Saviors (I, for example, will be going back in April 2014, but as a family holiday to show the locations to my children), it will be posted on the Lars Homestead page on Facebook. But I do not think it will happen soon, to be honest. The job is done, after all. But thanks to the books that I have published (Save the Lars Homestead, Tatooine Reunion and Trip to Tatooine), people have all the info they need to make their own way to that galaxy far, far away. TC: I can’t see myself going back out there for a long time… a long time. But perhaps that leaves an empty seat? Hard work is involved. High temperatures, long drives, poor hygiene and few luxuries. And always keep in mind that these sites are for EVERYONE, no fan can claim them as their own. They belong to the world, and they belong to Tunisia. Coxie: Be able to use a tape measure and saw in a straight line. DD: What is the one thing you want people to know or remember about the project, now that it moves into the annals of Star Wars history? MD: I would like for the fans to remember that this project was by the fans and for the fans. We could not have pulled it off without their support (donations). And we sincerely hope that the Homestead will be around for many more generations of fans to go out and visit it. RC: We did it for Star Wars Fans yes, but also for the people there. Many of us come from countries that are very privileged. I for one, feel that we have a duty to help others. I know what I want for my 40th!! I want to go to Tunisia. No. I *NEED* to go to Tunisia. I need to stand there by the igloo and stare off into the infinite horizon. 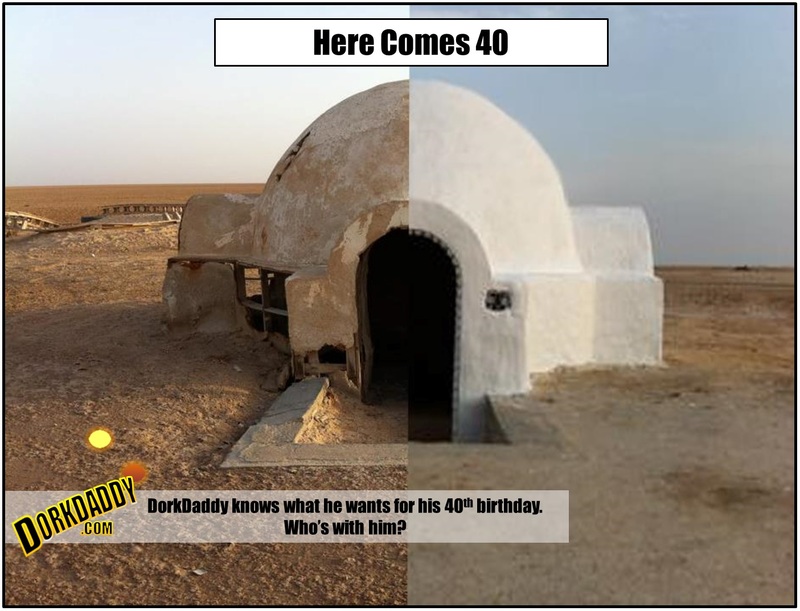 I need to feel the sands of Tatooine between my fingers. I need to hike the Star Wars canyon. 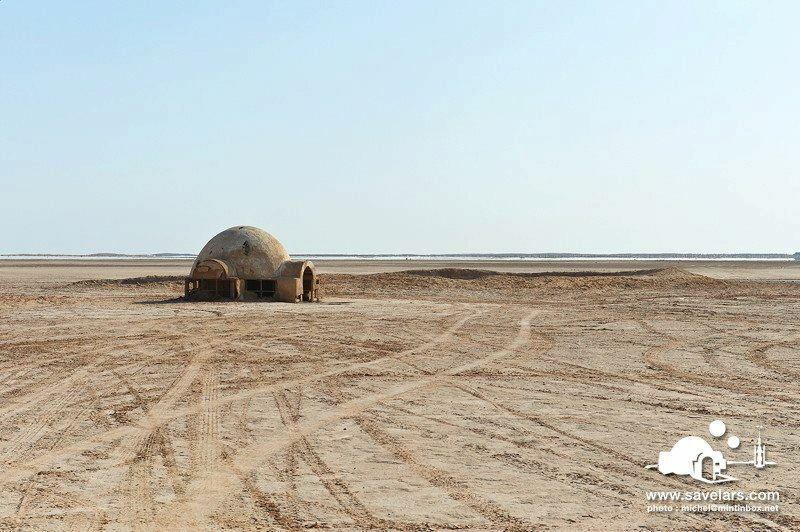 I need to see Ben’s hut, and the streets of Mos Eisley… and I need to do it before those places are lost forever. Long story short, he’s a military dentist and the only way he could get wife-approval was if they were stationed in Europe – which was a distinct possibility, but they wouldn’t know for sure until April or May of next year. In short, my best hope for a travel-buddy to Tunisia/Tatooine, enthusiastic though he may be, is tenuous at best. Which also means I am currently accepting applications. I need someone who is as much a Star Wars geek as I am, someone who is both up FOR it and up TO it. Lest any of you think I’m not serious, that I’m just being dramatic for the sake of my blog, let me reassure you to the contrary. I’m as serious as a Wookie with a hangover. 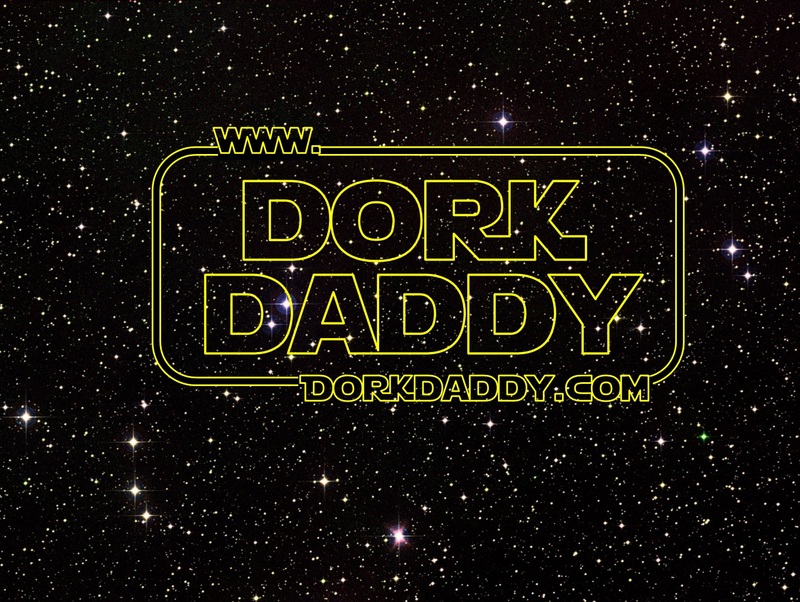 Today marks the 5th and final week of the Pringles Force For Fun, Dorkdaddy.com free Star Wars stuff giveaway. 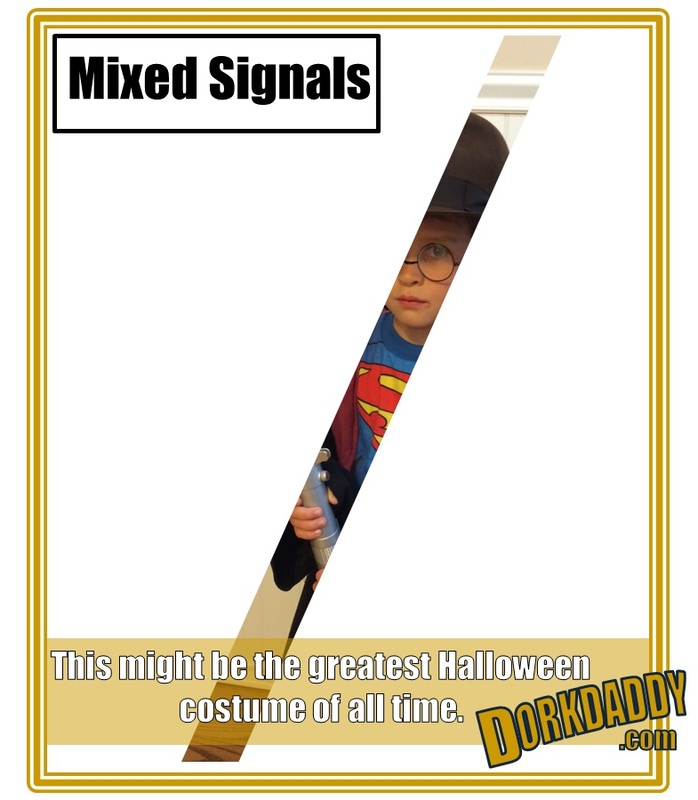 Thank you so much for your enthusiasm and patience with these little diversions away from the usual DorkDaddy.com material. I have the best readers in the blogosphere, and I am grateful for every single one of you. 1) Treat yourself to this awesome video below. 2) Click on the plushie Jawa and enter for a chance to win it. 3) Tell all your friends. o I had every intention of putting together a new blogpost today. Like normal I had it all laid out in my head, including text, links and pictures. But both the big kids were sick yesterday, so the usual routine around the house is in total upheaval. That and Episode VI decided about a week ago that he likes waking up between 4:30 and 5:00 in the morning. Don’t want to get him out of the crib at that hour? No problem. He’ll motivate you. “I’m just gonna keep turning up the volume on this screaming here until you break down and get me out of my crib,” he says. …I left my phone at home this morning; along with all the photos that I needed for the blogpost. What do you do when you’re all revved up to work on the blog but you don’t have any pictures to work with? Why, make up your own pictures of course. Week 4 of the Pringles Force For Fun, Dorkdaddy.com free Star Wars stuff giveaway starts now. 1) Treat yourself to the video below (for the record, it’s my favorite of the bunch). 2) Click on the R2D2 folding chair and enter for a chance to win it. Week 2 of the Pringles Force For Fun, DorkDaddy.com free star wars stuff giveaway starts now. 2) Poke the Ewok with a stick to enter to win some free Star Wars stuff.